Are “secret recipes” a thing of the past? 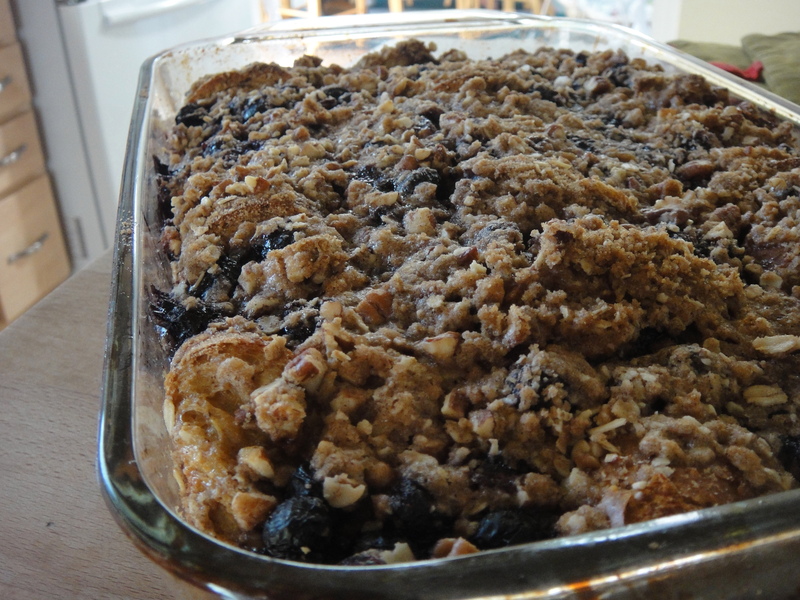 These days, the internet makes it easy to instantly access anything, recipes included. Often, you can find recipes for restaurant dishes (momofuku’s brussel sprouts anyone?) as well as recipes from cookbooks you might be too cheap to buy. Between blogs and other sites like Pinterest, people are sharing millions of recipes a day. It wouldn’t really occur to me to keep a recipe secret. If you like something I make, I’m flattered. You should make it too! I started thinking about this last night, when I was mixing up my favorite spice concoction to add to some raw almonds I’d bought recently (I’m not going to pay $2 more per pound for “roasted and salted!” I can roast and salt myself, thankyouverymuch). 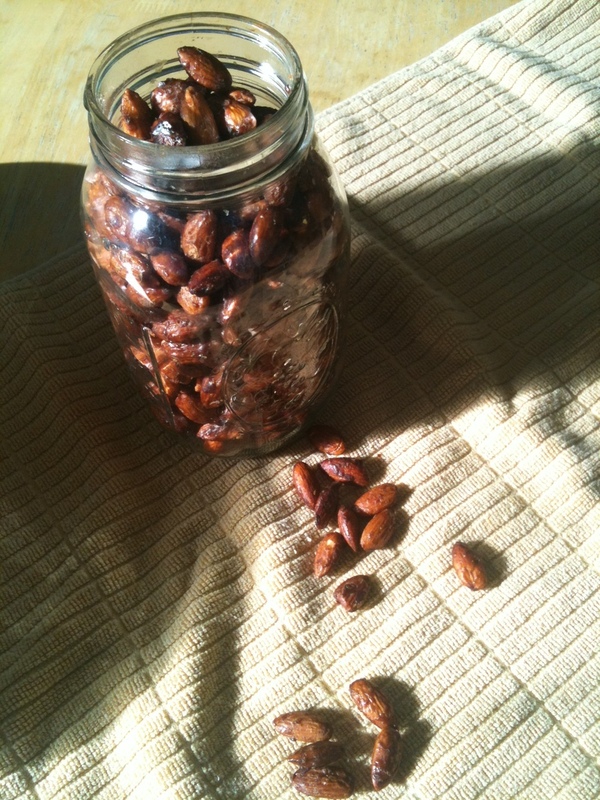 I first made this particularly variety of spiced nuts a few years back, when we had our first Thanksgiving in Seattle. I needed to take an appetizer to the gathering we were attending, and used the spices I could find in my cabinet. They ended up coming together quite well, and were a real hit at the party. The host asked me for the recipe, so I typed it up and sent it her way. Last night, almost five years later, I dug it up from my email (thank you gmail search function!) and got to roasting. If you feel like some spiced nuts this holiday season, I suggest these. But also don’t be surprised if I give you some as a gift. Maybe I’ll attach the recipe to the jar too. 2. Melt butter in a large, oven-safe skillet. Add sugar, spices and 1/4 cup water. Stir until the sugar dissolves. Add the nuts and cook stirring constantly for about 5 minutes. 3. 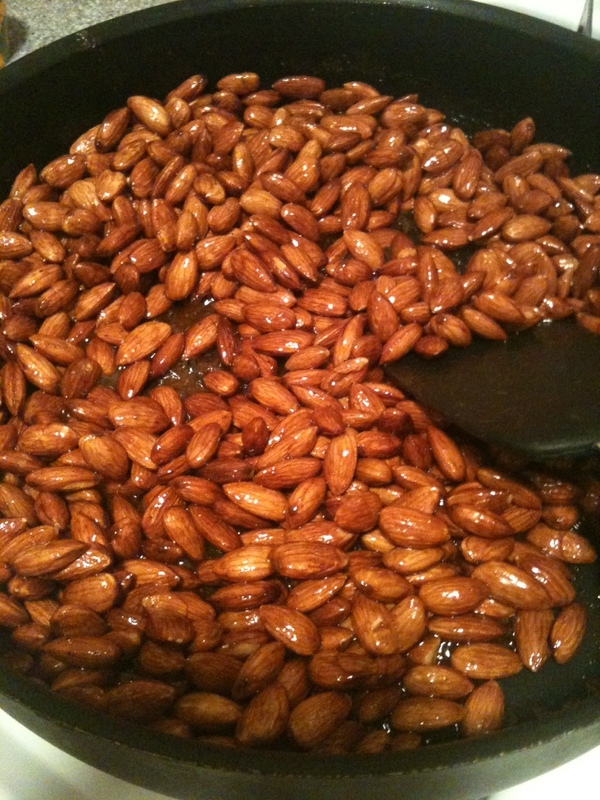 Once the nuts are coated and fragrant, move to oven and bake for 10-15 minutes, until brown. 4. Let cool. I usually move them around periodically while they’re cooling so they don’t get too stuck to the pan.